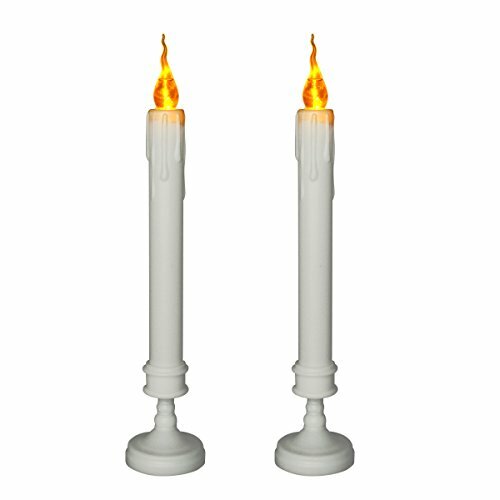 Youngerbaby Set of 2 Flameless Taper LED Candle,Cr2032 Coin Battery-Powered Candles Yellow Lights Wax,Flickering Bright Bulb Taper Candles with Ivory Candlestick Base for Thanksgiving, Home Decoration by Youngerbaby at Home Decor Outlet Store. MPN: Base_taper_mid_2. Hurry! Limited time offer. Offer valid only while supplies last. About LED Tape Candle with Light Bulbs Perfect for a rich holiday presentation, this taper candles is a great decorative accent in any space. Candle dimensions:Short,8.1" H x 2.2" D,Medium,10.2" H x 2.2" D,Long,11.4" H x 2.2" D.
Easy to use, simply switch on / off on the bottom to control the candle light. Main material: Plastic. Light color: Amber(yellow).Flameless, smokeless and long lasting, safe to use. Great for floral arrangements, weddings, home decor, churches, candle light vigils and more!